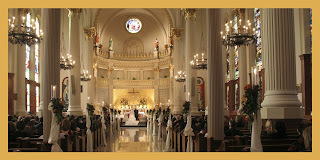 As some of you know, we are getting married at St. John the Baptist church in New Orleans, LA next year. While in New Orleans over Memorial Day, we decided to check it out. Although my parents were married in this church 29 years ago, I had never been inside. After Katrina it was closed for everything except weddings and funerals. We decided to get married here for many reasons: the church I grew up attending has been closed (Our Lady of Good Council), my parents were married here in 1980, it is close to my home, and it was free on the day and at the time we wanted to get married. It is absolutely beautiful inside. I knew all of these things before setting foot inside the church. However, there were many more things to learn as we wandered around that were just as magical. My fiance's nickname is cricket (given to him by his grandfather). When we entered the church, there was this seal on the floor - which has what looks like a cricket. Mary Ann (the volunteer wedding coordinator) said that after Katrina, when she came in to clean up - all she found were hundreds of dead crickets (the church hadn't flooded). She said that St. John the Baptist survived on crickets (or maybe locusts?) for a period of time, so she found it interesting. Another sign that this is the perfect place for us to get married? I don't know, but we both felt like it was a little wink in our direction.